And I'd better show you some buckets on a line to show these really are bucket-line dredges and so do all their own placer digging and feeding - unlike the dragline-fed Snowstorm Dredge (as I understand it?). Here are the buckets of the Bayangol Dredge. Its quite a remote place where the dredges are, and here is some of the wildlife. Moving a little downvalley, here is the first of the pair of Toson Dredges - both owed by a Mongolian woman miner Garamjav. This is the South Toson Dredge. It is slighty squatter than the sister dredges in order to enable it to twist and turn in the narrow floodplain it was designed for in Tolgoit in North Mongolia. 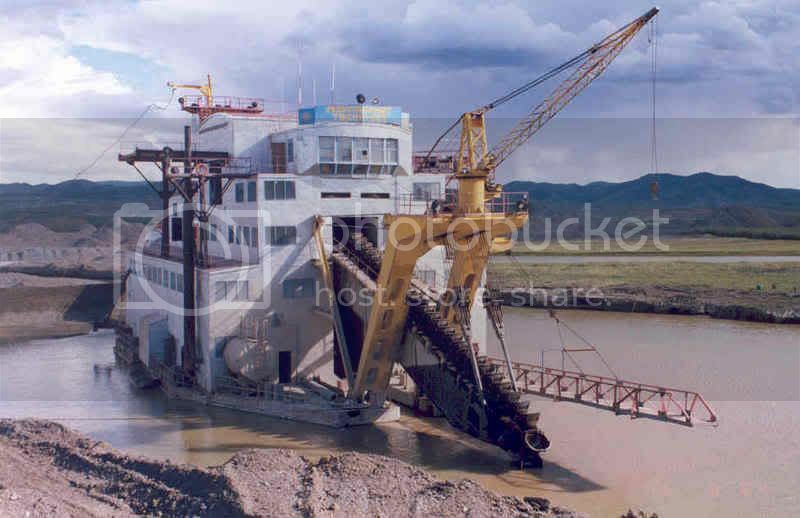 When it had exhausted its reserves, Garamjav bought the dredge had it cut up into about 200 truckloads and had it reassembled here in the Tuul Valley. You can see big bananas being formed by washed oversize dumped by the winterised rear stacker conveyor, and notice the 2 spuds - one up, one down - the down spud acts an anchor on which the dredge swings. Forward movement is by twisting the dredge and dropping the second spud and raising the first spud, rather like walking on stilts. The 2 discharge chutes are discharging water and undersize tailings from the washplany aboard the dredge. The fine tailings (with fine gold the sluices cannot catch, plus coarse gold stolen by sticky clay robbers) are dumped first and then buried by the oversize bananas (with nuggets and improperly washed clay balls with gold) of the crocodile. 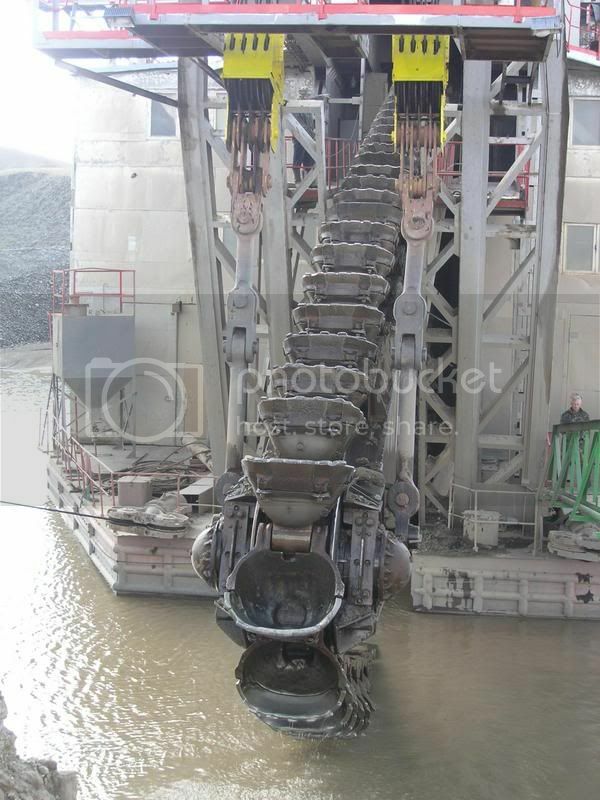 These dredges are designed to use mercury but do not do so - mercury usage at placer gold mines was BANNED in the Soviet Union and in Mongolia in order to protect the health of mineworkers. The design of the dredge remains the same. Here is the front end of the Toson Dredge. Being owned by a woman it is the neatest of the dredges! Phew - that's enough for the moment. As well as these 6 large bucket-line dredges in the Mongolian Dredge Fleet, there are about 20 small Chinese-designed tiny bucket-line dredges small enough for you to make in your garage. Any comments anyone so far? Nice to see you have a moment to drop by, and as normal, add to your ever bedazzling contribution on placer mining. I'm sure for most, as I, now seeing the dynamics of operations in your part of the world, puts a whole new slant on the scope of pulling gold from the ground. I'm very curious as to how much tonnage one of those bucket operations moves in a day? It must be phenomenal. And what is the average recovery rate, and their cut-off point? Needless to say, you work with a determined breed of people, for it's not only large scale operations occurring in Mongolia but it remains the livelihood of many (as you have shown us). By far, for the largest percentage around the world, there's something so unexplainably special about the glitter of that color. Most likely though, it's the fascination behind the challenge of conquering its unearthing into thy hand. I can't imagine how dull this world would be without the intrigue of prospecting. Very cool Pictures ,I have a freind who's dad is helping to start a ranch in mongolia .He stayed there for awhile but never mentioned any thing about dredges. I guess mongolias such a large country he might not have been in the same region.Does anyone know where one can see an old dredge in bc or alberta? would be curious to see one first hand. Those are sure great pictures. I saw a couple of dredges in Alaska (Fairbanks) and one in The Yukon. There is also one that has been restored near Baker City, OR. It is about 20 min from there in a place called Sumpter. They have a narrow gauge RR and some other stuff - if you are in Eastern OR it is worth a visit. There ia a museum in town that has a terrific rock collection - so good the Smithsonion? spelling? wanted it.